With proud records to protect at the Dakar Rally there was a growing sense of ‘now or never’ in the bivouac before stage eight. With the finish line fast approaching, big moves were required to upset the balance of the leaderboard. A big move is exactly what took place in the bike race as the Super Ica stage took place at Dakar. The Red Bull KTM Factory Team arrived in Peru a fortnight ago with a clear mission objective – win their 18th consecutive bike race title. At the conclusion of stage seven their best placed rider Toby Price (AUS) was third overall, behind rivals on Honda and Yamaha machinery. On stage eight the picture changed dramatically. Race leader Ricky Brabec (USA) saw his Dakar end on stage eight due to a broken engine. Pouncing on the opportunities that presented themselves in the dunes was 2016 Dakar winner Price. Third place on today’s stage has put the Australian at the top of the general classification. A remarkable achievement given that he has been nursing a broken bone in his wrist throughout the rally. After getting the better of both Honda and Yamaha rivals today, now Price’s closest competitor is the Husqvarna bike of Pablo Quintanilla (CHI). Quintanilla is just a minute behind Price while the Australian’s KTM team-mates are both five minutes further back as Matthias Walkner (AUT) and Sam Sunderland (GBR) are placed third and fourth overall respectively. A crash on stage eight brought the 10th Dakar participation of Stefan Svitko (SVK) to a premature end. The 2016 bike race runner-up was eighth overall when misfortune struck on the Super Ica stage. 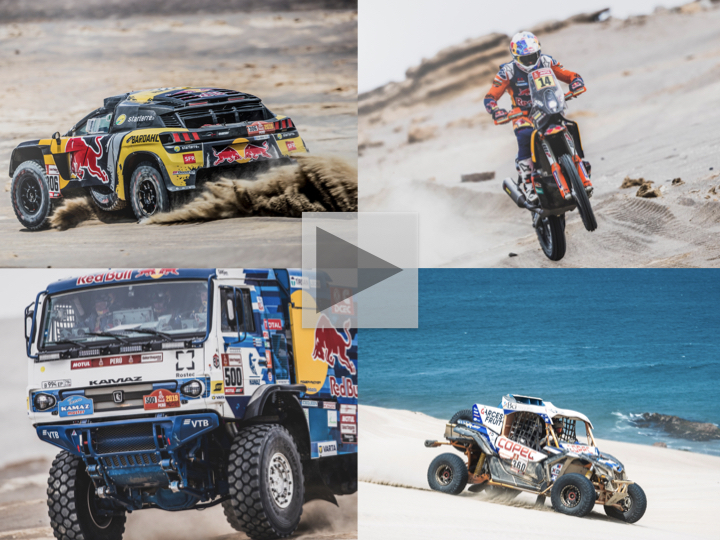 The latest episode of Dakar Daily covers all the stage eight action in the dunes and in the bivouac, watch it on Red Bull TV right now. In the car race there was a fourth stage win for Sébastien Loeb (FRA) and co-driver Daniel Elena (MON). The duo showed their customary impressive speed over the dunes to get themselves back in the game after a tough stage yesterday. Loeb’s most recent stage win puts him third overall, and just 16 seconds behind Nani Roma (ESP) in second place. It was a tough Super Ica stage for all three X-raid MINI JCW Team drivers: Stéphane Peterhansel (FRA), Cyril Despres (FRA) and Carlos Sainz (ESP). This trio of multiple Dakar winners all conceded time to their rivals in the Peruvian dunes. Eduard Nikolaev (RUS) was thankful of the big cushion he had previously built up in the truck race today. The Team Kamaz Master trucker got stuck in the same dune section that cost time for Despres and Sainz. Nikolaev ended up conceding nearly an hour as well as his lead to his team-mate Dmitry Sotnikov. The astonishing comeback of Chaleco Lopez (CHI) in the SxS/UTV category continues at an electric pace. The Chilean led the race in the first week before tumbling down the rankings after mechanical issues in the dunes before the Rest Day. Now Lopez is back on top and in pole position to win the Dakar on his SxS/UTV debut. If the competitors still in the race weren’t feeling dizzy enough already, tomorrow’s 313-kilometre loop around the Pisco bivouac may just push a few over the edge. We’re still deep in the Peruvian dunes as the leaders try to hold position, while their rivals launch attacks in the desert.